Landice offers top-rated treadmills, made in the USA. Landice is renowned in the fitness industry for offering the best warranty on their fitness equipment - including treadmills. Landice treadmills have a lifetime warranty, meaning that any problems after purchase will be fixed. The suspension on Landice treadmills is softer than grass, being a little softer on landing and stiffer on the end of your stride. Landice treadmills offer the most comfortable workout on the market for walkers and runners alike. 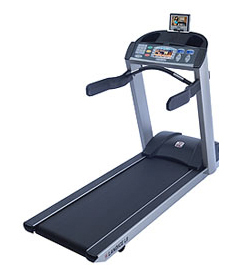 Landice treadmills are rated #1 in Runner's World© magazine and are top rated in Consumer Reports©. A small and sturdy home treadmill with excellent shock absorption by industry award-winner Landice. A sturdy home treadmill with excellent shock absorption and an oversized running area, by industry award-winner Landice.